Not sure what to shop for now that you are gluten-free? Use this guide to help you get started. See why ingesting gluten from wheat, barley, rye, and other grains may be detrimental to your health. Gluten sensitivity is not being properly diagnosed in nearly 97% of patients suffering from chronic illnesses. Gluten sensitivity may be responsible for: ADHD, autoimmune disorders, cancer, depression, reflux, thyroid disorders, obesity, and osteoporosis. Not sure what to shop for now that you are dairy-free? Use this guide to help you get started. Dairy sensitivities are occurring at epidemic rates and may be responsible for causing or aggravating many common digestive, behavioral, and health issues. Not sure how to avoid soy at the grocery store? Use this guide to help you get started. The soy industry and the media would have you believe that soy is a miracle food and that ingesting soy can help you overcome illness as well as enable you to obtain your optimal health. However, the most widely available forms of soy (non-fermented soy) are not healthy for you! This book is meant to help educate consumers, to shed some light on this “not-so-miracle” food, and to make everyone aware of the soy deception. Coconut oil is a healthy fat great for cooking and baking, as well as for its ability to help with thyroid, hormonal, and weight issues. Coconut oil is also known for its lauric acid content and its immune enhancing properties.Lauric acid has been shown in various scientific studies to contain bacterial and anti-viral properties. Use this quick reference guide to help you get started using more coconut oil in your diet. Ready to have more energy, feel better and maybe even lose weight? Follow this 5 step guide to start adding fats to your diet. The Skinny on Fats was written to educate you about the importance of consuming good sources of dietary fats. This book will teach you why we need fats and why we can’t live without them. Sheryl takes you (in groups of 4-6 people) on a tour of Whole Foods Market where you will learn how to shop for organic foods, find out what foods to eat and what foods to avoid, gather information about healthy replacements for common foods as well as what brands to buy that taste good. You will learn generally where products are located so you can confidently shop for groceries. Don’t wait until you are too stressed out to handle planning dinner, use this handy tool to help you schedule meals for the week in advance and keep you on track with your health goals. Keep this on hand at the store so you can shop for only those items you need and not get caught buying unwanted foods or junk food. Carry this resource to the grocery store with you so you know which foods to eat and which foods to avoid. Don’t leave home without it! Recipes with kid friendly ideas! Not sure how to feed your kids healthy snacks and meals? Check out this resource with some alternative ideas and recipes for some kid friendly favorites. 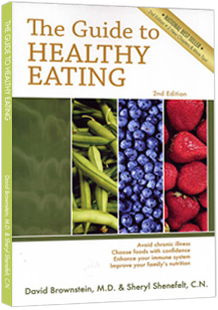 Check out the 2nd Edition of The Guide to Healthy Eating for more information, tips, and resources. What do I eat? How do I cook healthy food? How do I shop for healthy food? The Guide to Healthy Eating will show you which foods are healthy and which food you should avoid.